Hot out of the oven and baked fresh everyday this week... Irish Soda Bread is one of those items, we only make seasonally. With St Patrick's Day on a Saturday, it makes for a full week of Celtic themed creations. From frogs to shamrock cookies, our store turns greener with each passing day. Though we've become quite known for our hand-rolled Irish Potatoes, it's our Irish Soda Bread that seems to draw attention each year. In 2016 we were voted one of the city's best by CBS Philly and received mention in a Pennsylvania review. 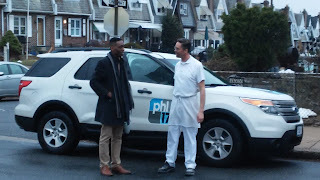 This year PHL17 reporter Khiree Stewart came to the bakery to cover our Irish Soda Bread in the making. As he was interviewing my father-in-law, I was listening to the explanation of what makes this bread different (other than the taste). Terms like leavening, soft flour opposed to strong flour, the lack of yeast driven fermentation, and a heat activated reaction with "soda", were phrases simply mixed in the conversation as naturally as the words "the" and "and". I came to the realization that most people would have no idea what Richard Haegele was talking about, especially since the "soda" most familiar today, is a beverage out of a can. "Soda" is short for sodium bicarbonate or more commonly, baking soda, a once kitchen staple in many households. Irish Soda Bread is an item of tradition in a Celtic kitchen, but to a baker it's science at work. I observed my father-in-law's enthusiasm over this "non-conventional" bread as Glen further explained that understanding the climate and agriculture of Ireland gives way to the ingredients in Irish Soda Bread. The cold damp region would never lend itself to anything but a wheat producing a softer and lower in protein "winter flour". A soft flour and the lack of heat in the regional homes would never lend itself to the proofing of a yeast risen dough. The expense of yeast would have also made it an ingredient of luxury in old-world Ireland. The need for daily bread was there and the Celtic home found a way. Baking soda is heat activate in the oven. It reacts with the softer flour and causes the dough to rise. With a tone of amusement my father-in law chuckles and says "see...no yeast in the dough, no proofing at all"... and yet you have bread. To those listening it was both a little lesson in history and a lesson in science. 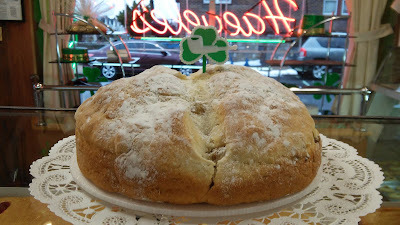 How can a German Bakery make one of Philadelphia's best Irish Soda Breads??? The answer was in front of the camera...Richard & Glen side by side, dressed in their bakers' whites, sharing their true knowledge and passion for the art and Science of Baking.